Jacksonville, Florida, is a destination that really takes outdoor fun seriously, with more than 220 sunny days on average each year. Freshly opened with impeccably swanky decor, the upscale River & Post is Jacksonville’s latest, greatest place to impress a date or your boss during a business meeting, with valet service and an unbeatable view of the St. Johns River and Downtown Jacksonville. 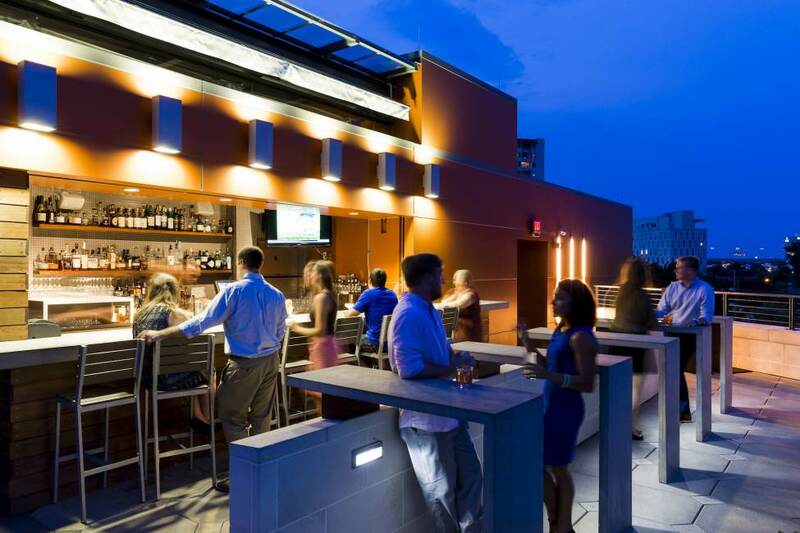 Outdoor couches and fire pits complement the snazzy rooftop bar that serves all the way til 2 a.m. In case of inclement weather, there’s a retractable roof and a connected inside bar that allows you to still enjoy the view. 1902 vintage historic Bostwick Building, Cowford Chophouse offers one of the best views of Jacksonville and refined craft cocktails for a four-star steakhouse experience that’s a cut above the rest. Another late-night destination whose non-residential location lets them serve on the roof until 2 a.m., this 5 Points bier garden scores points not just with its drinks, but also with an array of outdoor games like billiards, foosball, shuffleboard and more. Accentuated with wild steampunk art on the rooftop bar, Hoptinger Bier Garden is a hit with the professional happy hour set for its whimsical, handcrafted cocktail presentation in the casual rooftop lounge. The lounge is open Thursday and Friday nights, and all day and all night Saturdays and Sundays, and there’s another Hoptinger Bier Garden location right on Jacksonville Beach. Casa Marina is just one of many great places to stay in Jacksonville, where fantastic outdoor bars will have you shouting from the rooftops. So raise the roof by planning your next trip to Jacksonville, where the downtown skyline and beachfront views are absolutely tops. Jax – it’s easier here.